The National Exhibition Centre (NEC) in Birmingham has rolled out a new wireless network to tackle the rise in demand for Wi-Fi connectivity. Based a short distance from the city centre, the NEC plays host to more than 140 trade shows and events each year – from Crufts to the Gadget Show Live – and sees more than two million visitors come through its doors annually. With such large visitor and exhibition numbers, it was clear the venue needed a strategy to provide a wireless network for both exhibition staff and visitors. The NEC had been offering Wi-Fi from The Cloud over its own network for public consumption, but found the solution could not handle the number of users wanting to run bandwidth-hungry applications over the connection. “The infrastructure needed refreshing due to its age,” said Murray Dickson, business solutions analyst at the NEC. “It was no longer fit for purpose, due to the increased demand for data connections in a venue of our size, and we needed a high-capacity solution to manage the total number of concurrent, heavy-bandwidth users across the NEC’s site. The venue has now deployed 155 Xirrus Wireless arrays across the site, with both 2.4GHz and 5GHz compatibility depending on a user’s choice of device. Xirrus claimed the network was capable of serving up to 22,000 users simultaneously, covering the organisers' offices and conference suites, as well as the public exhibition spaces. After the contract was awarded in mid-September 2012, planning ran until November, and deployment of the technology took until the end of January 2013. The solution was put to the test in the first week of February, when the NEC hosted the Spring Fair International – the largest UK trade fair, attracting more than 68,000 visitors – and saw more than 19,000 devices connected to the network, half of which were smartphones. It gave the event organisers an opportunity to launch a mobile application to accompany the show, driving traffic to certain spots and encouraging deals to be done in a more connected environment. It also allowed users to keep in touch with their work and personal lives, making the experience of a day out of the office less problematic. “Xirrus’s experience of configuring radios in these environments was invaluable in the planning process, and the installation – in spite of being a complex and intense process – ran smoothly,” says Dickson. “It’s still early days, but we had positive results from our launch at Spring Fair International,” he adds. 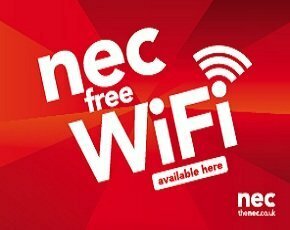 The NEC has decided to make Wi-Fi access free to its visitors, despite the large investment it has taken to get the system up and running. “There was no other option for us,” says Dickson. “As the UK’s number one exhibition venue, we wanted to break the industry mould by providing a basic Wi-Fi service in all areas at no cost to visitors. Now Dickson and his team are looking to the future and building on the connectivity they have brought to the NEC so far. "Wi-Fi is one part of a bigger connectivity project within the NEC,” he concludes. “We’ve also upgraded our ISP feeds into the venue, and we’re working with mobile network operators to improve our 3G and 4G connectivity, as well as using the new Wi-Fi we’ve installed to offload some of the traffic from the 3G network.